The Japanese art of raising bonsai trees is a beautiful way to infuse greenery into indoor spaces. 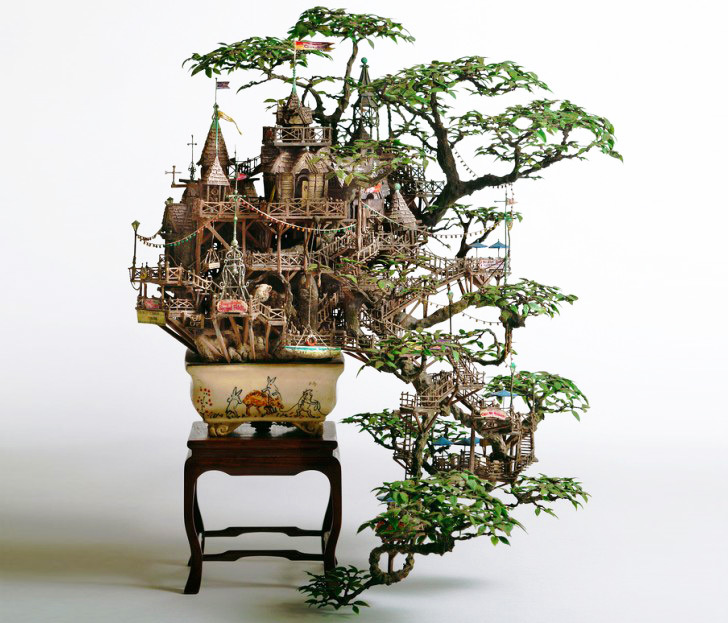 But artist Takanori Aiba takes the art to a new level with his incredibly intricate series of bonsai castles. 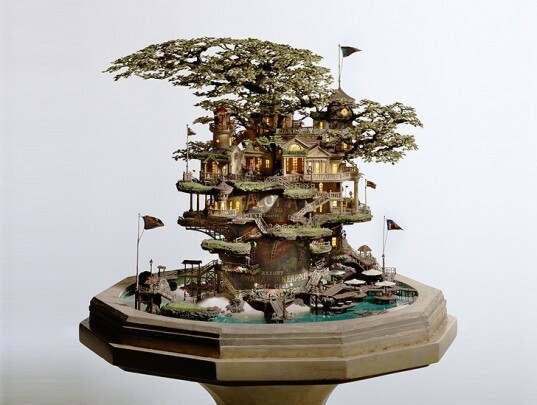 The Japanese artist carves miniature masterpieces that weave in and out of the miniature trees, creating cohesive architectural marvels that burst forth with life! Treating each tiny Bonsai as if it were a deep-rooted full-sized tree, Aiba creates incredible buildings that wind around the boughs and branches. Using copper line, epoxy putty, plastic, resin and stone clay, he fashions detailed buildings, bridges, balconies and towers. Using the bonsai trees as the foundation, the dioramas are inspired by the unique shape of each tree, creating both vertical and horizontal landscapes and buildings. 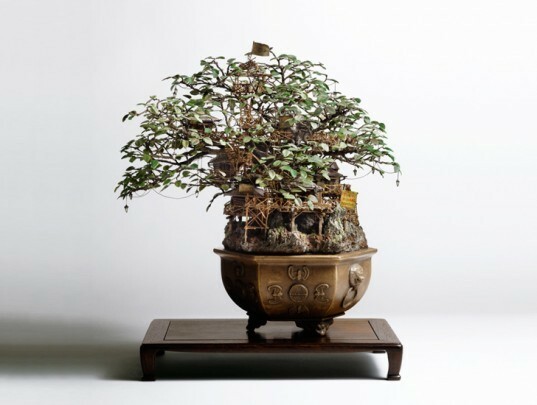 Aiba’s first few creations relied heavily on the function of the bonsai as a tree. The plants hold tree houses, and the leafy branches of the bonsai poke out of the tops and cascade to the floor. Each branch is adorned with patios, umbrellas, and tiny strings of lights, creating an incredible dwelling for a miniature Swiss Family Robinson. Branching out, Aiba created a larger dwelling by recycling a pineapple can. The “Hawaiian Pineapple Resort” adds a fantastical theme to the everyday can while adding greenery that pokes out from the resort roof. The treehouses evolved into towering lighthouse dioramas perched high on traditional rocks, with the delicate foliage encircling Aiba’s spiraling wooden walkways leading to the lighthouse model on top. Aiba’s architectural explorations also developed into the quirky Michelin hotel, which is a stone clay figure of the famed Michelin man. Hotel windows poke out around his body, with foliage, bonsai trees and balconies lining his abdomen and legs. Tiny Rolls Royces wait below. 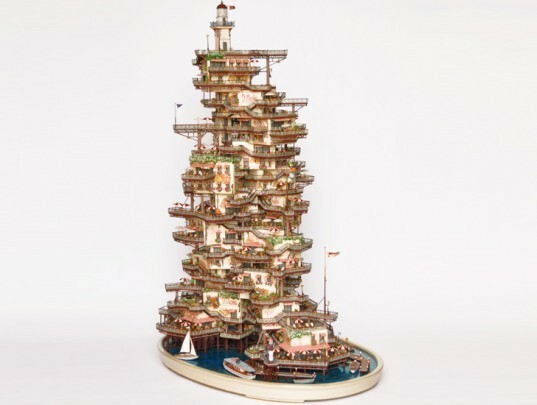 The largest of the dioramas is called “Ice Cream Packages Tower.” Made from stained paper and wood, the levels cantilever unevenly on top of one another, carrying red and white ice cream shop awnings throughout the entire model. Each of the bonsai dioramas are fitted with a beautiful custom terrarium casings, which range from simple cubes to more Victorian shapes that evoke the structure of botanical gardens. The tiny treasures are truly inspiring, and add a creative craft to the already beautiful tradition of raising bonsai trees. Damn they are really beautiful. Where can i buy one? I have already Flying Bonsais from www.air-bonsai.net but but Takanori Bonsais are the champs! These are simply exquisite AND show that not only is Aiba talented with the art of Bonsai but also is fantastically creative with doing the miniature buildings. absolutely gorgeous and fantastically magical. Love it! I wonder what is in your mind Mr.Takanori.. really inspirative for me. salute.. Absolutely brilliant design work. I'd love to see these scaled to reality. Great feature, Lori! Treating each tiny Bonsai as if it were a deep-rooted full-sized tree, Aiba creates incredible buildings that wind around the boughs and branches. Using copper line, epoxy putty, plastic, resin and stone clay, he fashions detailed buildings, bridges, balconies and towers. Using the bonsai trees as the foundation, the dioramas are inspired by the unique shape of each tree, creating both vertical and horizontal landscapes and buildings. Branching out, Aiba created a larger dwelling by upcycling a pineapple can. The “Hawaiian Pineapple Resort” adds a fantastical theme to the everyday can while adding greenery that pokes out from the resort roof. The treehouses evolved into towering lighthouse dioramas perched high on traditional rocks, with the delicate foliage encircling Aiba’s spiraling wooden walkways leading to the lighthouse model on top. Aiba’s architectural explorations also developed into the quirky Michelin hotel, which is a stone clay figure of the famed marshmellow Michelin man. Hotel windows poke out around his body, with foliage, bonsai trees and balconies lining his abdomen and legs. Tiny Rolls Royces wait below.